The leeward coast of west Hawaii Island supports a dynamic social-ecological landscape that includes the largest expanse of native dry forest fragments left in the Hawaiian Islands. These forest fragments occur from sea level to 2500 m elevation, support a largely endemic and highly threatened biota, and provide critical ecosystem services such as clean air and water, soil formation, climate regulation and capacity to store carbon, as well as diverse cultural, recreational and educational opportunities. While many lands across Hawaii have conservation status, the potent forces of invasive non-native plants and animals are wreaking havoc on native dominated natural areas that have been so painstakingly set aside. Further, independent and uncoordinated land-use decisions often leads to a landscape comprised of fragmented habitats which serve both human needs and Hawaii’s unique flora and fauna poorly. The current trajectory for these ecosystems is unfortunately one of continued rapid degradation and extreme marginalization. 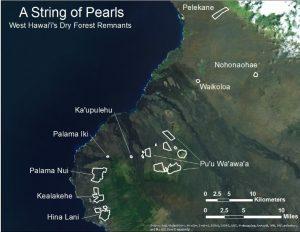 Nāhelehele is committed to the establishment of west Hawaii dry forest corridors that connect remnant natural systems and areas in the region based on priorities established by community input. The goal of the project is to empower relevant community stakeholders and land stewards to preserve these valuable natural resources for the benefit of future generations. For plants and animals, corridors allow movement between isolated populations, promoting increased genetic diversity and ecosystem sustainability. For humans, corridors connecting forest fragments maintain and enhance ecosystem services such as healthy air quality, reduced urban warming, and protection from devastating wildfires. In addition when we preserve and protect native plants and animals we not only increase the green infrastructure* of the region we promote the capacity for these areas to become refuges for culturally significant species. Many of Hawaii’s dry forest fragments are important refuges for culturally significant and often highly endangered species of which should be given special consideration as their bio value (cost to replace if lost) is significantly higher than areas without these species. By enhancing the ecological function and aesthetic quality of natural areas by interconnecting them, we counter habitat fragmentation and loss and promote collaboration with adjacent jurisdictions to preserve, protect, restore, and enhance natural and culturally important areas. This project provides an opportunity to turn the tide and move forward through community based land stewardship committed to the rural green economy, social entrepreneurship and responsibility. This project represents a grand opportunity to address not only forest degradation from a community based effort but to address a much larger human/natural coupled ecosystem approach towards effective natural resource management of a landscape. Communities and ecosystems in Hawaii are small, compressed in scale, and close knit and therefore represent a model system to measure tangible benefits to both the community and the ecosystem. You can read more about Nāhelehele’s efforts to establish dry forest corridors in the ‘Ōuli Park page, and the Kona Open Space Network page. *Green Infrastructure (GI) is the living network that connects landscape areas, natural areas, and waterways. In urban areas, GI captures rainfall; cools buildings and pavement; and creates natural pathways for wildlife.